General Electric Company, Eaton, and Philips Lighting Holding B.V., have been the three leading players in the global energy efficient lighting market over the recent past. According to Transparency Market Research, their collective revenue of 83% of the global market in 2015 shows their collective success rate in the market in terms of technological developments and distribution strength. Philips and Eaton have so far been neck and neck in the competition. At the same time, there are multiple regions that hold a massive number of local players, despite the stronghold of the leading players in the global scenario. China, for instance, has shown a stern resistance to market penetration by international players, due to its solid regional base of players. The global energy efficient lighting market is expected to be valued at US$15 bn by the end of 2024. It was calculated at US$5.49 bn at the end of 2016 and is likely to continue expanding at a whopping CAGR of 13.4% within the report’s forecast period from 2016 to 2024. “As it stands, perhaps the greatest backers for the global energy efficient lighting market are national governments themselves. The demand for energy-efficient solutions is extremely high in all regions of the world, regardless of their economic standing. One of the areas where government support shines through is in the warehouse segment of the global energy efficient lighting market. An example for this would be the banning of incandescent bulbs in warehouses and similar spaces. This mandate has given rise to a huge demand for smart lighting solutions including the distribution of LEDs and the use of remote lighting control systems,” states a TMR analyst. 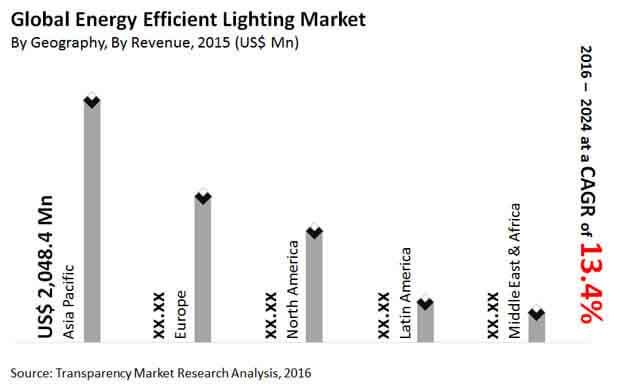 The global energy efficient lighting market is also benefitting from an increase in demand for them in storage spaces that require refrigeration, cooling and ventilation, or heat and light sensitive materials. In Europe, the market for energy efficient lighting is currently booming due to the implementation of standards such as the Energy Performance Certification, which need any commercial space that wants to be certified to be using the given energy saving measures. While the overall global energy efficient lighting market is expected to rise at a phenomenal rate over the coming years, segments within the market are currently in competition with each other. Based on the type of lighting source, the global energy efficient lighting market can be segmented into high-intensity lamps, linear fluorescent, light emitting diodes, and others. LFLs had experienced a positive demand volume in the recent past. However, the falling prices and growing level of average efficiency of LED lightings have created a drastic drop in the demand for the former. Over the coming years, LEDs are expected to outshine LFLs in terms of profitability and demand volume. “Emerging economies are expected to be key locations for players in the global energy efficient lighting market as the market progresses. Developed economies are already showing not only a high demand for energy efficient lighting, but have also incorporated a very high scope of implementation for them. On the other hand, the market is still relatively newer in emerging economies, thereby creating a massive untapped area left to fill in by the globally prominent players and local players alike. The situation is made even more feasible by the growing spending power of these nations, through either government incentives or improving economic structure,” adds the analyst.